Fourteen years after the end of The Clone Wars, the Empire takes notice of a threat— a band of rebels that could some day form a greater Alliance. Disney was pretty serious about their acquisition of Lucasfilm, weren’t they? No messing around— the Mouse people knew what they were doing. This was a property that they had plans for. There would be no languishing for years after purchase (hello, DreamWorks and your various questionable acquisitions). It seemed like only moments had passed before Disney announced their intent of reviving the Star Wars film series, and we all knew that other merchandising would be hitting fast and heavy. With the films a given, and toys a must, one big question was the fate of the franchise on television. The beloved Clone Wars show had run for five seasons on Cartoon Network already, with a sixth season ending up on Netflix and home video once Disney took over. Further episodes were in question, depending on how Disney wished to proceed; but even aside from Disney’s wishes, Clone Wars had had a lot of input and direction from George Lucas, and the Clone Wars production staff had mixed feelings about continuing without Lucas anyway. And thus Clone Wars came to a close. Lucasfilm Animation was given a new mandate, which they gladly took on: create a show that bridges the two film trilogies. The result is Star Wars: Rebels, set fourteen years after Episode III: Revenge Of The Sith, and five years prior to Episode IV: A New Hope (known to many of us old-timers as simply Star Wars). The Empire is now fully in charge. The joy that accompanied the end of the Clone Wars has been replaced with something else. To many, there is little doubt that the Empire is a fascist outfit led by a supreme dictator, using thug-like tactics and propaganda to stay in charge of countless star systems. The people living in these systems have begun to both grow weary of their oppressors, and scared for their lives should they not cooperate with the authorities. There is a growing sense that something must be done, but those in the main planetary centers are relatively powerless in the face of their oppressors. Yet, on the outer rim of the galaxy, the Empire’s hold is somewhat more tenuous, and even though those residents may not feel the full presence of the Empire, it is in these secluded regions where rebellion may be most likely to start. 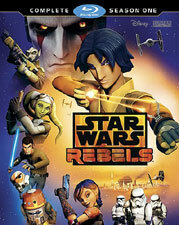 Rebels premiered on the Disney Channel initially in October 2014, before moving to Disney XD. The pilot was first shown as a one-hour special, called Spark Of Rebellion, though it is presented as two separate episodes on the Blu-ray set. The pilot introduces us to the crew of the Ghost, a ship that can disguise itself from Empire tracking, in order to conduct attacks or otherwise disrupt Empire business on the outer rim planet of Lothal. 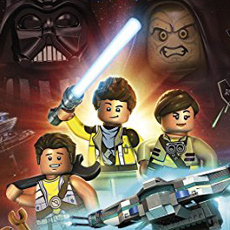 One day, they encounter a rival operator, a teenage boy named Ezra Bridger (one wonders if he was named so because his adventures will bridge the gap between the two film trilogies). Ezra conducts his own raids on Imperial Stormtroopers, but purely for the sake of helping himself. At first, he cannot understand the more altruistic motivations of the Ghost crew, and rejects their offer to join them. 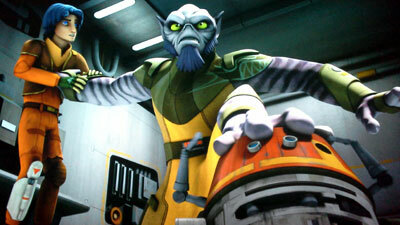 However, he begins to form a bond with their leader Kanan Jarus after discovering that Kanan is a Jedi. 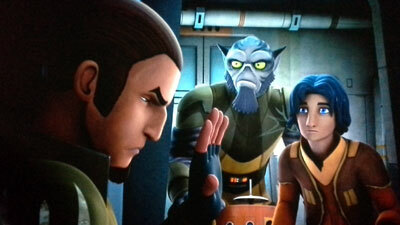 Meanwhile, Kanan is motivated to take in Ezra when Ezra demonstrates strong ties to the Force. 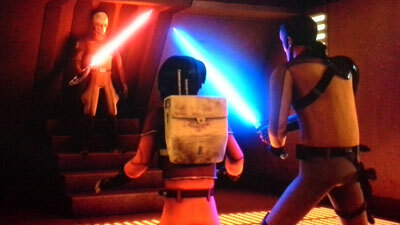 Erzra then joins the others on a mission to free a shipload of Wookies. Even just during Spark Of Rebellion, many familiar sights are seen, with many poor-aiming Stormtroopers, various ships, and of course the Wookies (even if they are poorly rendered, showing the limitations of the show’s CGI). Even Darth Vader is glimpsed. In the following episode, Droids In Distress, we also get reacquainted with R2-D2 and C-3PO (Anthony Daniels, naturally), who are initially in conflict with the Rebels, until things are sorted out in the end. Right from the start, Ezra is in conflict with fellow rebel Zeb, a hulking somewhat cat-like being, but anyone can see they will eventually form a brotherly friendship. That comes to fruition in Fighter Flight, when they steal a TIE fighter together. Then, Ezra’s relationship with Kanan is furthered in Rise Of The Old Masters, as they attempt to rescue a Jedi master but run into the Jedi hunter known as The Inquisitor. Ezra then goes undercover on his own at an Imperial academy in the exciting Breaking Ranks. Then, Out Of Darkness throws the spotlight on the two female members of the crew. 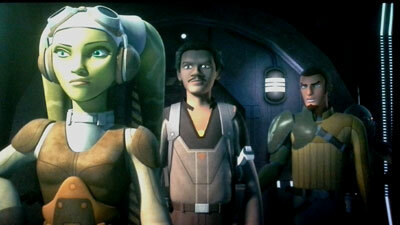 Hera is the pilot of the Ghost, and the one most closely associated with the mysterious Fulcrum, a person who provides guidance for the rebel forces. This rankles the Mandalorian girl named Sabine, whose stubborn and controlling nature makes it difficult for her to trust anyone who isn’t fully in her sights. The two women have to band together in order to survive a perilous trip to another planet, where lethal creatures threaten their lives. 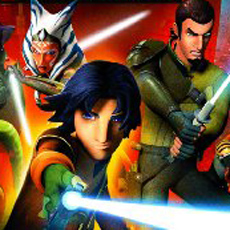 The mystery behind the disappearance of Ezra’s parents is the focus of Gathering Forces, but Ezra and Kanan once again come into conflict with The Inquisitor, and Ezra learns of the power of the Dark Side from personal experience. This scary moment leads to Kanan taking Ezra to a Jedi temple on Lothal in Path Of The Jedi, in order to learn more about the Force and what it means to be a Jedi. 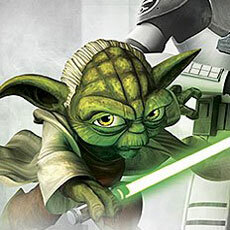 Frank Oz guests as the voice of Yoda in this episode. 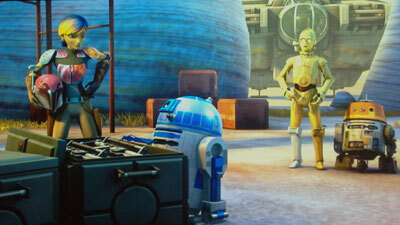 Another familiar voice is featured in Idiot’s Array, when Billy Dee Williams joins the cast as Lando Calrissian. This is apparently after Lando has already lost the Millennium Falcon, and he connives a way of having the Ghost crew help him to acquire some illegal cargo, with Hera as the bait. Meanwhile, Lando also holds ownership of the crew’s temperamental droid Chopper, whom Lando has won in a card game with an embarrassed Zeb. The world of our Rebels is broadened further when they meet the fugitive-in-hiding Senator Gall Trayvis in Vision Of Hope. What they learn in that episode inspires the Rebels to craft a bold mission that will see them take over an Imperial communications array on Lothal in Call To Action. 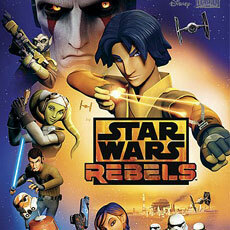 It is their hope to contact other worlds in order to inspire other rebels to fight the Empire. 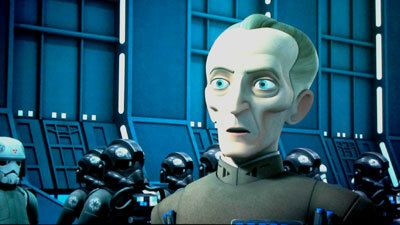 Unfortunately, they have also attracted the attention of Grand Moff Tarkin, who personally comes to Lothal to take over the Imperial operations there and capture the rebels. 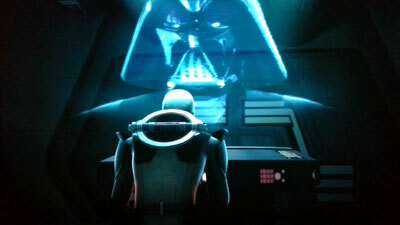 Tarkin downplays the reports of there being a Jedi on Lothal, but he is eager to meet the much-rumored adversary. The result of that meeting necessitates a rescue mission for the crew of the Ghost in Rebel Resolve. That mission comes to a head in Fire Across The Galaxy over the prison planet of Mustafar. The actions of the Ghost crew bring them not only the full attention of the Empire, but also other rebels that they had hoped to both inspire and join. It is at this point that the story of Rebels really begins. 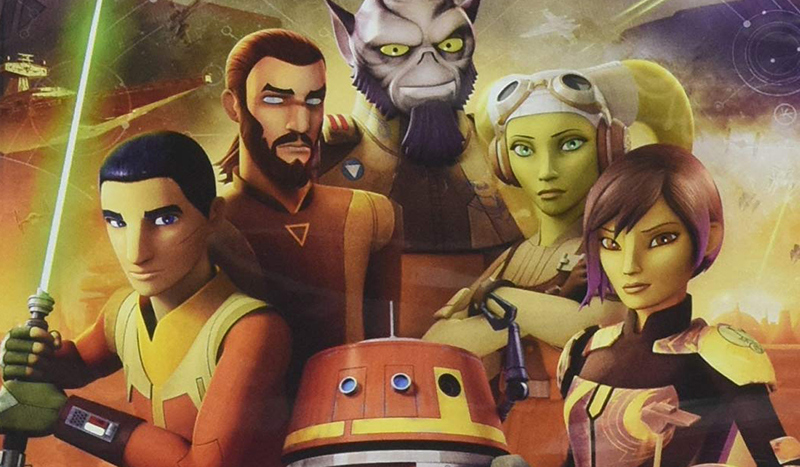 Indeed, the entire first season of Rebels seems like a prologue to the show we have really been waiting for. Over the course of the season, we are introduced to the Ghost crew, and see in microcosm how the Empire has affected the galaxy. 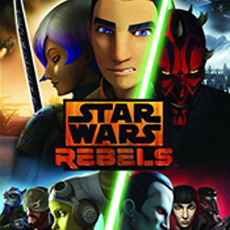 I certainly felt that the series was extremely confined and small in scale, compared to what he experienced in Clone Wars, but I had faith that co-executive producer Dave Filoni (who also ran Clone Wars) and his own crew would eventually get around to bringing us the full origin of the Rebellion. Season One is just about putting the pieces in place, before all heck breaks loose in Season Two. There is no doubt at the conclusion of Fire Across The Galaxy that the series is about to gain greatly in scope, as more old faces return, questions are raised about the end of the Clone Wars, and new allies are found. 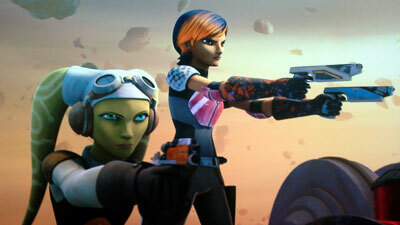 The opening season of Rebels was always intended as an introduction, so the scale remains less than epic for most of this season. You may yearn for something greater, but there is always a sense that patience shall be rewarded. In the meantime, every episode has value in terms of character development, exciting action, and numerous cool moments that will delight any Star Wars fan. Those that didn’t care for the look of Clone Wars may like Rebels even less, given that so much of the action takes place on barren Lothal, limiting the amount of eye candy on display. It also seems that old lessons may need to be relearned in terms of the animation. 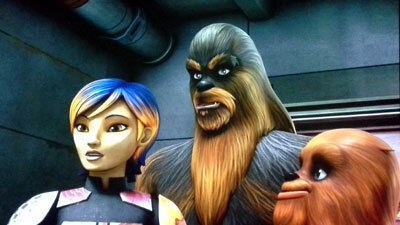 The hairy Wookies look terrible, given the show’s style of having all hair move as a single chunk. And some characters, Lando in particular, are over-animated to the point of looking painfully like buffoonish puppets; this sadly undermines Williams’ oh-so-smooth delivery of his lines. On the other hand, when facial expressions are under-animated, the characters’ acting is severely compromised. I thought that Clone Wars became much better with its animation during its run, so I’m a little puzzled as to why this show seems to be starting at the beginning of the learning curve again. Nevertheless, the show remains fun and thrilling. And the best, I’m sure, is yet to come. This Blu-ray set excels with its supplemental features. Each episode gets a Rebel Recon segment lasting about five minutes. 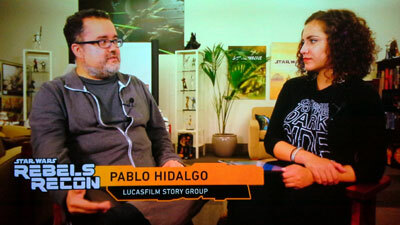 In those few minutes, the episode is recapped before several interview segments are hosted by Star Wars social media correspondent Andi Gutierrez. Here, she discusses the series’ direction with Dave Filoni, she asks questions of Lucasfilm executive and Star Wars lore-master Pablo Hidalgo, and also talks to various other members of the production staff. Each of these segments is a great companion to its respective episode. Rebels Infiltrates Star Wars Celebration (4:03) is a nice look at how the show has already impacted the annual Star Wars convention. 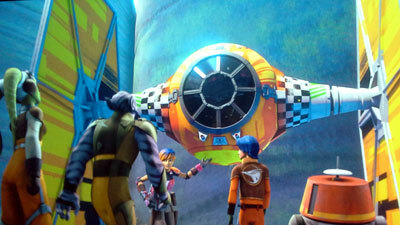 We see footage of the Rebels panel, interviews with production staff and voice actors, and some great cosplay. Star Wars Rebels: The Ultimate Guide (22:05) is a rundown of the whole first season, hosted by Kanan, voiced here as usual by Freddie Prinze, Jr. You know, I had never really valued Prinze as an actor (Scooby-Doo having scarred me), but he does a great job at bringing all the proper nuances to Kanan. This featurette, though, is pretty skippable, as it is just a quick tour of everything you have just viewed. It could be a great primer, though, just before you head into Season Two, if it’s been a while since you’ve seen the episodes, or if you’re helping a friend catch up. Rebels Season Two: A Look Ahead (7:06) is a cruel, wonderfully exciting suggestion of what awaits us in the coming season. Aside from tantalizing hints from Filoni, we also get to see some snazzy concept art. Before the series premiered, there were four RebelsShorts, each lasting about three minutes, that were shown on television and online. 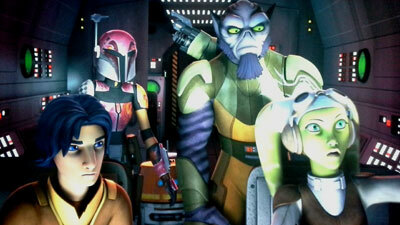 Each focuses on a different crew member, prior to Ezra joining the crew. They are presented here in the bonus material, though they could certainly be viewed first. The first disc also has Sneak Peeks for Star Wars: The Force Awakens and Aladdin. This region-free release comes in a standard Blu-ray case, with a Blu-ray disc on each side. There are inserts for Disney Movie Rewards and the Disney Movie Club. The cover slip has some nice embossing. 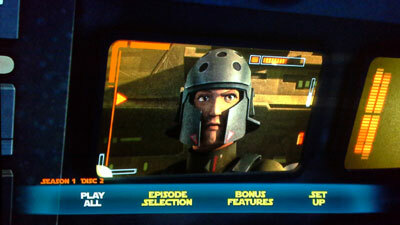 This series is shown on television in a 16:9 ratio, and that is how it appears in this release, breaking with the format of the Star Wars: Clone Wars series, which nicely utilized the 2.35:1 ratio to match the Scope-formatted films. Aside from any budgetary imitations, this show looks great on Blu-ray, perfectly capturing all the action and color of the series. Though humans don’t generally come off all that great in how they are animated, the Stormtroopers are often photo-realistic, and the few space shots we get do look epic. English, French, Spanish, and German speakers each get Dolby Digital 5.1 tracks. That’s right, no lossless sound on this release, which is sure to disappoint many, but is in keeping with what we always got with Clone Wars on Blu-ray. As such, despite the fun sound design, including use of several sound effects from the film library, the sound is never all that it could be. Still, there is some nice bass, and attention is given to having the surrounds pitch in during battles in particular, but also with ambient sounds. Subtitles are available in English (SDH), French, and Spanish, and there are English captions as well. This is not yet the show that fans are dreaming of, but the pieces are in place. 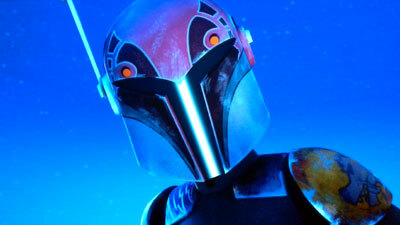 Given how wonderful that Clone Wars turned out, I have little doubt that the same will happen for Star Wars – Rebels. We have an engaging cast, including a type of Jedi we have not seen before; and a few mysteries have been set up, not to mention a huge set-up for the second season, which promises to up the stakes in a big hurry. The bonus features on this set make it a strong recommend even if you have already caught the show on TV.